A salon at L'Ermitage de Pompadour, a former home of Charles, Vicomte de Noailles, and his wife, Marie-Laure, in Fontainebleau, France. 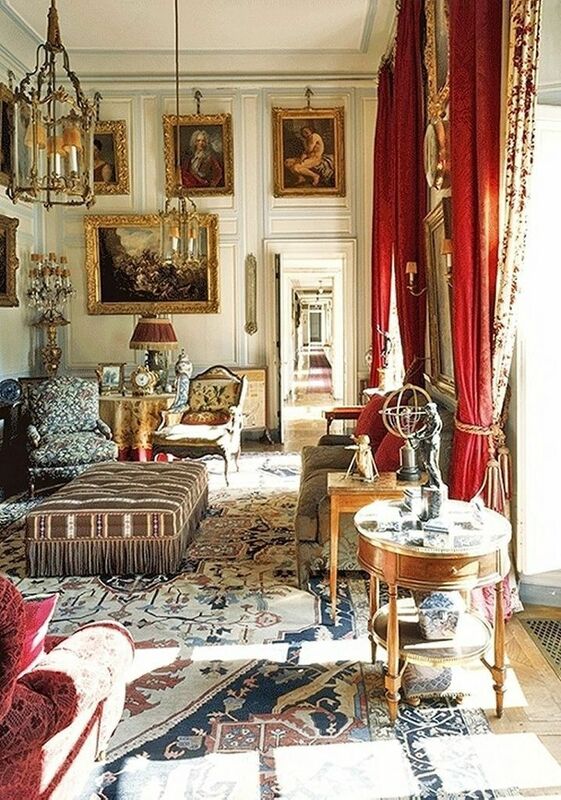 The 18th-century building—which was constructed for royal mistress Madame de Pompadour and is now owned by Noailles grandson Carlo Perrone—and its six-acre grounds are being sold for $9.3 million. 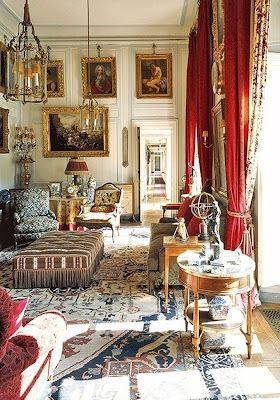 So said Italian newspaper publisher Carlo Perrone in The New York Times on 30 June 2011, recalling one of his family's French residences, L'Ermitage de Pompadour, which recently came on the market after nearly a century in private hands. The six-acre estate in the commune of Fontainebleau, near Paris, was purchased in 1919 by Perrone's great-grandmother Madeleine de Noailles, Princesse de Poix. It is being sold through Emile Garcin. The scent-conscious grandfather to whom Perrone refers was French society figure Charles de Noailles (1891—1981), an inspired patron of the arts who created some of the most inspiring gardens of the 20th century. The Vicomte de Noailles's strategic positioning of perfumed plants at his Fontainebleau residence is worth remembering when the subject turns to gardens or even spare rooms, for that matter. I, for one, would cultivate tuberoses beneath all my bedroom windows or perhaps Confederate jasmine or great masses of Oriental lilies. The one that will get away, for want of winning the lottery. Don't you think dreams are improved by scented flowers? Glad to know you're still out there and hopefully enjoying the summer. This is one of my favorite houses EVER! As a L'Ecole des Beaux Arts student at Fontainebleau during the summer of 1975, my class visited the vicomte for a tour that I will never forget. Whenever I think of scented flowers beneath a window, I think of Brideshead Revisited. Charles' Cousin Jasper comes to visit him in his first floor rooms at Oxford and tells him to change his rooms. "I've seen many a man ruined through having ground-floor rooms in the front quad." Charles thinks, "I do not know that I ever, consciously, follwed any of this advice. I certainly never changed my rooms; there were gillyflowers growing below the windows which on summer evenings filled them with fragance." ....and tuberoses are the ticket for carried scent. Heady is an understatement. I suppose I should be grateful there are still people in the world who share this sentiment. Growing up in Los Angeles, there were night blooming jasmines under both of my bedroom windows. The scent on summer nights was incredible and transporting, almost too much for a silly teenager enamored of fantasy novels! Unable to grow that up here, I put dianthus (gillyflowers) and Oriental lilies under the windows. It's nice, but not nearly so strong and heady. 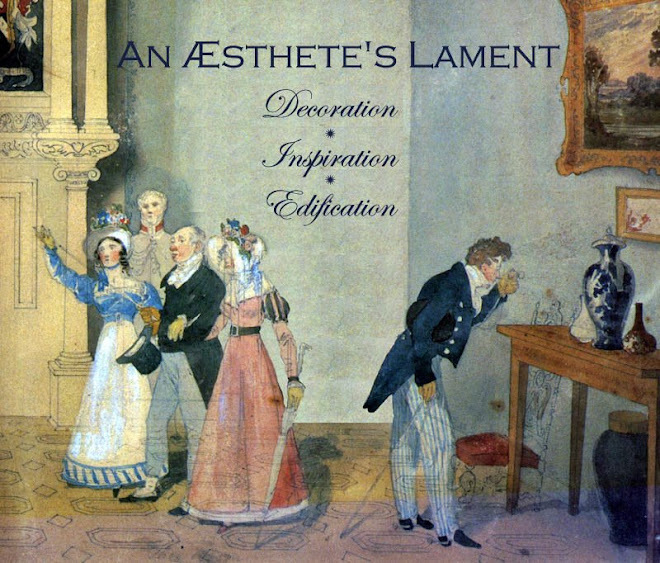 We need to be giddy with delight that the Aesthete is still writing to us! Let alone such meaningful and lovely posts! what a thoughtful and lovely idea.......enchant the guests with fragrance under their windows?? To quote a famous taste maker; "now thats a good thing". Many years ago while perusing Cyril Connollys' LES PAVILLONS, I recalled a beautiful Bessarabian carpet in the library...fast forward late 90's to early 2000- Tony Duquette had gotten this somehow, and it was sold either thru the ELSIE DE WOLFE FOUNDATION sale or his own Christies sale. I did not act fast enough but all in all got what I wished for from both sales. This BIJOUX of architecture is safe unlike Villa Trianon? But of course! Love your blog! What a gorgeous interior! And what a lovely way to be a gracious hostess...scent is such a wonderful way to improve one's outlook. I just moved to 93 acres in the country and when I step outside and smell the delicious aroma of pink clover I instantly feel happier! Fabulous property, and I shall never forget the scented flowers beneath the windows! Living in Los Angeles, I planted Cestrum Parqui (common name there, Night Blooming Jasmine) outside our bedroom. I wanted my wife to be enchanted by scent in the summer. It was so scented she had to close the windows. Do I need another wife?